In our experience, measurement, collection and reporting of website data are usually not a well-defined piece of a marketing plan for many businesses. One such area where marketers often struggle with Google Analytics (GA) reports is related to campaign attribution. Due to technicalities and nature of the internet, it is not straightforward to know the details of all inbound links to your site. However, appending inbound URLs with parameter/value pairs helps assemble the additional information. 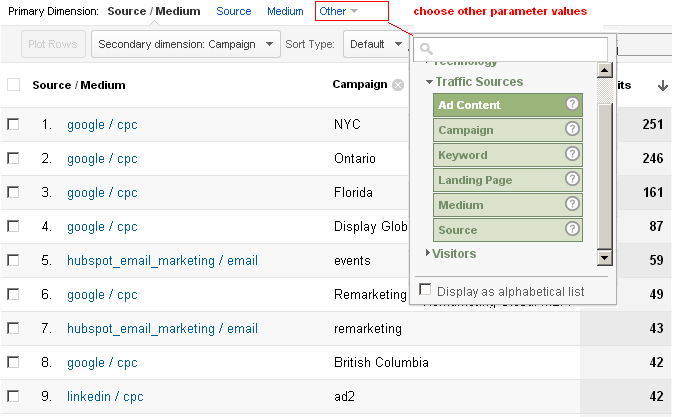 The following simplified example illustrates how to reclaim some valuable data by including GA campaign related parameter/value pairs in links inside emails, banners, social media, etc and get meaningful insights utilizing various reports. The sample table below shows one of many ways of labeling tags for various campaign URLs. Google’s URL Builder is also a good resource for creating links with campaign parameters. Using a combination of utm_content parameter along with shortened URL provides an additional layer of granularity for individual marketing pieces. Parameter values passed in the URL are then available in various GA reports drop-down through options, as shown in the image below. The tagged URLs simplify reporting on digital signals and help optimize marketing campaigns. Initially there will be challenges in implementing the link tracking. Here are few suggestions that will help keep the process relatively smooth. Integrate tracking into campaign planning. Keep everyone on the same page by creating and sharing link tracking guidelines and related documents. Tap into all available resources and develop close coordination between marketing creativity, technological talent and analytical discipline for meaningful data collection. Remember, a methodical and collaborative approach will reduce inconsistencies surrounding online data acquisition and repay in expansive reports capable of lending deeper understanding. Conversion metrics or visibility metrics?